The boyfriend has been on a pomegranate kick lately. I’ll see him standing at the sink, staring pensively down, hands subtly moving…doing what? Inspecting the sink for scratches? Ruminating over the dirty dishes I haven’t cleaned from the last baking project? Trying to secretly get rid of something down the garbage disposal? No, he’s patiently taking apart a pomegranate, removing the arils in the sink so he doesn’t get ruby red pomegranate juice stains all over the kitchen walls. There’s an elegant poetry in the working of his hands around the plump fruit; the careful opening of the fruit, like the revealing of a heart; the patient, delicate extraction of the arlls; the orderly discarding of the peel and pith in a neat pile, with not a single aril lost. My boyfriend’s love of precision and cleanliness makes him an ideal cook – and disassembler of fruit. So, inspired by all the lovely red fruit about, I decided to make these panna cottas topped with a layer of pomegranate jelly – the look is very berries-in-the-snow, isn’t it? I played around with ideas for different flavors for the panna cotta, but found a can of lychees in the cupboard and had my answer. I really like the combination: the lush, floral sweetness of the lychees make a good match for the clean tartness of the pomegranate, and reinforces the tropical sensibilities of the dessert. I love the taste of lychees, although I’m not the biggest fan of their texture; I find I like them best when their flavor is infused into a dessert, like ice cream. Panna cotta also proved a perfect base for the lychees, providing a wonderful backdrop for their honeyed flavor. Panna cotta has gained a reputation as a finicky dessert, and indeed, rubbery panna cotta is certainly a sad thing. But as with all recipes involving gelatin, it’s really a matter of using the correct proportions, and the entire process of actually making the panna cotta is so laughably short, it’s astonishing that such a simple recipe could yield such sublime delight- or invoke such fear in the maker. A couple of my thoughts on panna cotta: since this dessert is all about cream (after all, it means “cooked cream” in Italian), using quality cream is of paramount importance. Although many panna cotta recipes use just cream, others use yogurt, buttermilk, or sour cream, to add flavor while boosting the creamy mouthfeel of the final product. Some panna cotta recipes cut the cream with milk, as I do, for panna cotta on the more ethereal side of the spectrum. But don’t ever use only milk, or less than whole milk, or you’ll end up with more of a milk jello, which is exactly what you don’t want your panna cotta mistaken for! 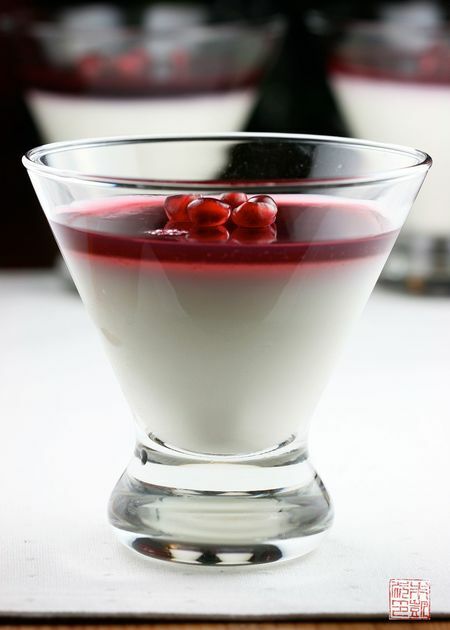 If you do want to unmold them, though, try spraying the glasses very lightly with a flavorless oil before you pour in the panna cotta, so they will unmold more easily. If they are really stuck, dip the glasses briefly in a bowl of hot water and then flip over onto a plate. The boyfriend gave these two thumbs up, although he might have been a little miffed that I used some of his precious pomegranates to make them. Don’t worry; I got him more to make up for it, although I think this dessert more than justifies a little pilfering? Open the can of lychees and pour the lychees and syrup into a food processor. Process until the mixture is smooth. There will still be little bits of lychee flesh and pulp. Strain into a measuring cup until you get 1 cup of clear liquid. Place 3 tablespoons of cold water in a small bowl and sprinkle the gelatin over the top. Let sit while you do the next step. Combine lychee liquid, cream, milk, and sugar in a medium saucepan. Heat on medium, stirring, until the sugar is dissolved and it just comes to a boil. Remove lychee mixture from heat and add gelatin. Stir until the gelatin is fully melted and combined. Divide mixture among glasses and refrigerate until set, at least 2 hours. 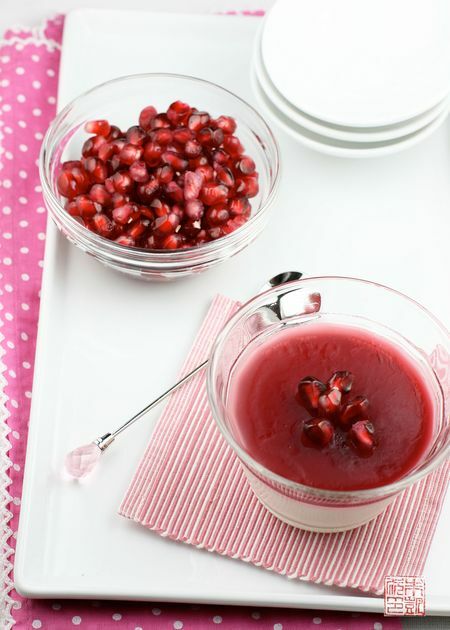 Combine pomegranate juice and sugar in a medium saucepan and heat on medium, stirring until sugar is dissolved. Add gelatin and stir until it is fully melted and combined. 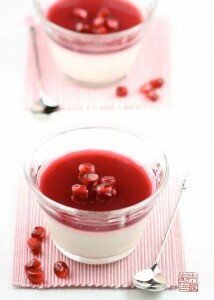 Pour pomegranate mixture over the panna cottas and refrigerate until set, about 2 hours. Wow. I love the flavor of lychees and the flavor of pomegranates. It looks delish! Thanks for all the yummy delights! I can’t help but notice you have lovely spoons. May I enquire as to where you purchased them? Wow….that looks really beautiful. I can even have it for breakfast. Looks perfect for the coming Valentine’s Day. That panna cotta is lovely and your shots are gorgeous! I love this presentation. I used to make pannacotta at a restaurant I worked at in Berkeley, and Michael Bauer reviewed it a text book perfect, and it was really smooth and tasty I must say. The owner and the servers hated it though, because they could not for the life of me learn how to unmold it, so they never really wanted to suggest it to the customers, and we were an “Italian” restaurant. Frustrating! I am starting a new job and if I make it again I will try to serve it like this, in glasses to avoid the unmolding step. It’s look so good ! Absolutely stunning as usual. I love lychees too. I’ve been afraid of panna cotta ever since I first(and the last)time I made them because it turned out so rubbery! I will definitely remember this entry in the future if I ever dare to venture into making panna cottas. On a side note, my mom was on a pomegranate craze too. Our fridge was PACKED with them!! Anitha, this looks so delish, I would love to try this. But where do you get gelatin powder, can we substitue with gelatin sheets, if so how many should I use. Please let me know. This is a surprisingly tricky question, because gelatin sheets come in different sizes and strengths so it’s not a simple conversion. One envelope of Knox gelatin (the type I use) has about 2 1/2 teaspoons of powder, and I have seen conversions ranging from 3 to 5 sheets of gelatin for one envelope. David Leibovitz has written an excellent article about gelatin, and there is a link at the end of the article to an eGullet discussion about gelatin conversions. I would check to see what is the strength of the sheets you have, and test a conversion with this recipe or another – it may take a couple tweaks to get the results you want. Good luck! Pomegranate and panna cotta – perhaps the perfect marriage. Thank you! Gorgeous presentation, Anita. And of course, anything with Lychee instantly gets my vote. Toss ’em in some ice cold Vodka for a great pairing! That last shot is stunning. I might see if we can make it at college this week. This looks fabulous! 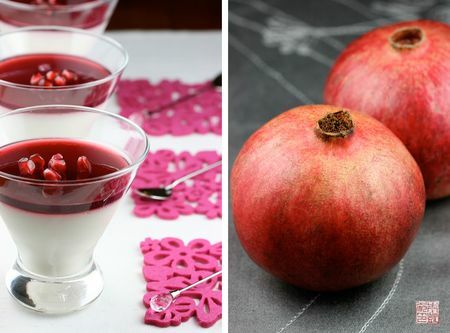 While I’m not a fan of cream-type desserts, I might be swayed by the pomegranate part – it sounds delicious! Those look delicious and so beautiful. Funny what you said about the texture of lychees. When I was young my dad told me that lychees were cow’s eyeballs (I had only seen them fully peeled at that point). I argued with him for half an hour that they couldn’t be, could they? And he never backed down. For years I doubted him, but there was always that nagging feeling that maybe, just maybe he was right. Then several years later when I left home and did my own grocery shopping, I pretty much figured it out. I always was annoyed at him for that. Excellent post! I love the spoons! I think this is just about the most perfect panna cotta I’ve seen! Gorgeous! I love pomegranate but never made desserts with it. This looks absolutely delicious and what a stunning presentation too! I wish you all the best. Looking forward to new posts.. Stunning photos. I love the dessert dishes you used. My Costco had them for months and months, but the day I decided to go and buy them, they were all gone. I was bummed. I made these by reference of a good friend. These turned out to be a big hit. So simple to make and modify to different flavors. I got so carried away and tried it with yogurt in sub of the jelly. Thanks for the great recipe! Lovely recipe surely going to try this out this week. Just a question can I substitute mangoes in place of pomegranate. Also is the pomegranate fresh or store brought. Thanks for visiting! I used pomegranate juice and not squeezed out of pomegranates. If you use mango juice either from a can or fresh squeezed I think it would be ok, just avoid getting pulp in the juice or it may not set smoothly. Hope that helps!